All through college I sang in a Madrigal choir and, of course, we always did a big Madrigal dinner at the beginning of December each year. 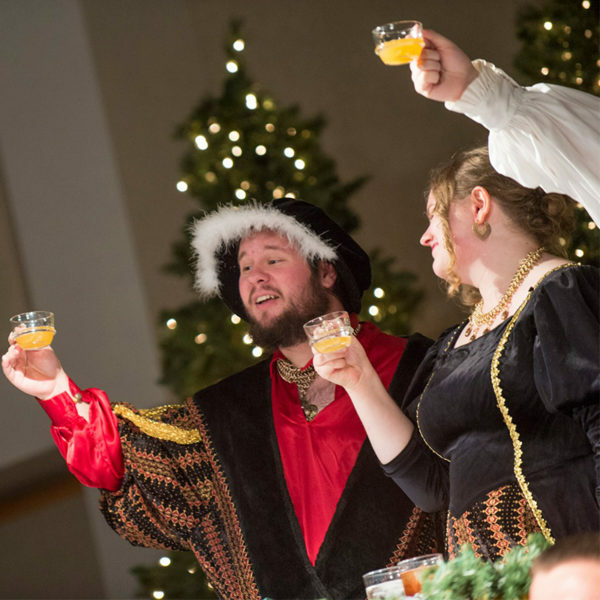 Four nights of performances during which a huge roast beef four-course meal was served, medieval dances performed, a fake Boar’s Head was carried through the room while we sang the Boar’s Head processional and…of course – we sang Wassailing carols while hot Wassail was served. Wassail is a hot spiced cider drink. It’s not for everyone, but I sure think it’s delicious. There are versions of wassail you can make in a crock pot, but I like to make it on the stove. It smells WONDERFUL. You should definitely have some friends over during the holiday season for some gaming and make a pot of Wassail. Your house will smell wonderful and I think everyone will enjoy this traditional Christmas beverage.